You may know her from the pages of your favorite magazine or from the Fast & Furious movies, but did you know Gal Gadot was Miss Israel at age 19 and served two years in the Israel Defense Forces? Needless to say, the actress and model has been on our ones-to-watch list for some time. And this is just the beginning. Gadot will play the role of Wonder Woman next year, and more recently, she’s starring in the new campaign for Gucci Bamboo (which smells amazing, by the way). We got the chance to chat all things beauty with Gadot, and rest assured we got all the details on her skincare regimen, fitness routine, and must-have products. Scroll through for Gadot’s beauty secrets! You have such beautiful skin. How you take care of your skin? Gadot: First and foremost is to drink lots of water, because it doesn’t matter how much moisturizer you put on your skin; if you’re dehydrated from within, nothing will help. So water. I make sure to clean my skin really well before I go to bed, I wear very light makeup in my day-to-day life, I go to cosmetician every once in a while, I wear sunscreen, and that’s it! What does your everyday beauty routine look like? Gadot: Very simple. Because I wear a lot of makeup when I work, in my day-to-day life I don’t like to wear a lot of makeup. I think that less is more. I make sure to moisturize my face really well. And if I do need to put some makeup on it would be very light. I usually mix my foundation with my cream, and apply it on my skin. I use La Mer, the classic Moisturizing Cream ($85), and for the makeup I use the Tom Ford Foundation ($80). It’s really light, and still gives you the coverage that you need. And then I use some blush, some mascara, some bronzer, and off I go. What’s your red carpet beauty style? Gadot: It’s fun, because I don’t like to wear a lot of heavy makeup in my day-to-day life, so I get to play with more-dramatic looks for red carpet events. It depends, because if I have heavy eyes, then I won’t have anything on my lips; and if I have lips then, I’ll go lighter on my eyes. But I think I am more into lips on the red carpet. Any favorite lip colors to wear? Gadot: Red or burgundy—MAC’s Diva ($17). How does fragrance fit into your beauty routine—either every day or special event? Gadot: It just does! Always, day and night, I make sure that I wear my perfume. 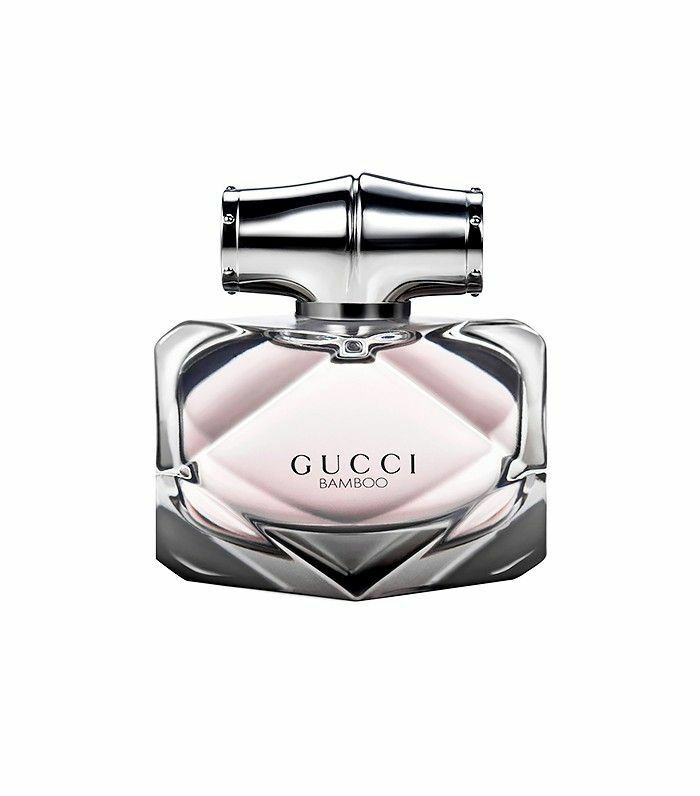 When Gucci called me and asked me to be the ambassador for this new perfume, I was thrilled and immediately I said yes. Then I had a creative call with Fabian Barrens about the concept for the campaign, and I was so happy about that because he told me about how they want the Gucci Bamboo woman has to be feminine and soft and at the same time confident and strong. And I love that idea! And then we hang up the phone and I was thinking to myself, Wait a second—I have no idea what the fragrance smells like! Because you know when you do something like this you want to make sure that you relate to the perfume, and like it, and can stand behind it. So a few days later they sent me the perfume, and I was so relieved because the fragrance was really good, and it’s very rare that you have a new perfume that’s this good on the market. What does Gucci Bamboo smell like? Gadot: It has a presence, but not dominant, strong presence; it’s just right. It’s sweet but not too sweet. It’s fresh, it’s clean, it’s light, and it is just so good. After the perfume came out, I went to the store and I got one all the women in my life. And I am probably going to do it again for Christmas just because they enjoyed it so much. It’s just the best gift. You star in a lot of action films, and you’ll be playing Wonder Woman soon. How do you get in shape for those demanding roles? Gadot: I can’t get very detailed with the answer yet, unfortunately, but yes, it’s different than anything I have ever done before. And I came from a very athletic background. It’s very intensive. It’s a lot of fun and I really enjoy it. It’s such a privilege to have to work out and be in such great shape for a job. It’s a great time; I really enjoy all the training. It’s obvious that when you’re not filming, fitness is still important to you. What’s your favorite workout? Gadot: I like TRX, I like boxing, and I like paddleboarding the most. Any on-set beauty tricks you swear by? Gadot: When I’m working and I have a lot of makeup on my face, and I feel like my skin is getting dry, I use the Evian Mineral Water Spray ($13) on my face. It just gives a whole boost of moisture to the face and keeps the makeup in place. It’s easy! I am so into easy. What about when you come home from working and have to take all of that makeup off—any tricks there? Gadot: Oh gosh, when I’m working I really look forward to taking all the heavy makeup off after a long day! 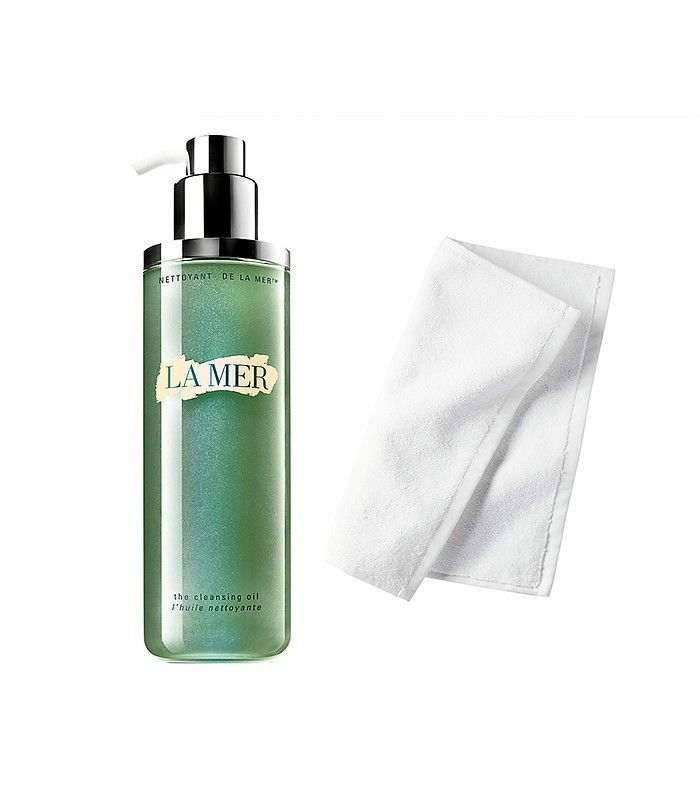 And usually I do it with the La Mer The Cleansing Oil ($85). And if I really want to treat myself, I put a moist towel in the microwave, heat it up for about a minute, and then I take all of the makeup off with the hot towel, and I will just wash my face. And if you put some lavender or any essential oils that you like on the wash towel, then it’s really, really good. Have you ever tried Gadot’s washcloth-in-the-microwave trick? What weird skincare tricks do you swear by? Tell us in the comments below!